It was the opposition to the federal government’s pension reform that united the protesters that on Sunday took to the streets all over Russia. In Murmansk, peaceful demonstrators gathered in the local park at Leningradskaya Street and then moved towards the regional government building. 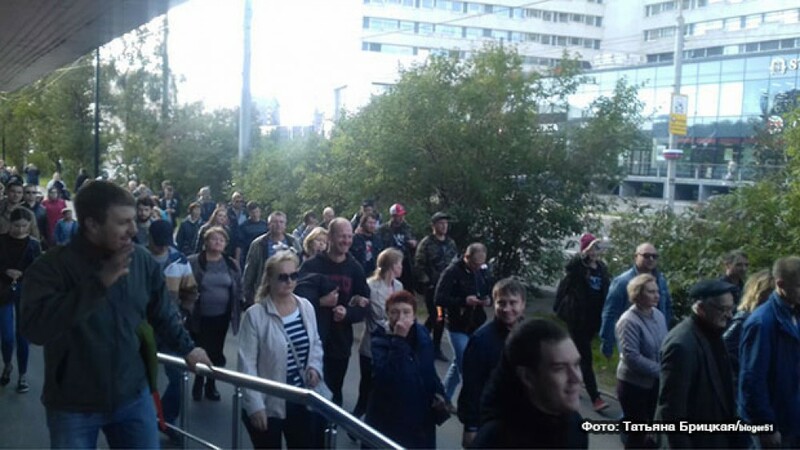 About 300 people ended up in front of the government offices of Marina Kovtun, Bloger51 reports. While there was a brutal police clampdown on demonstrators in cities like St.Petersburg, it all proceeded in peaceful manners in the Russian Arctic capital. Many shouted «Kovtun must go!» and some even knocked on the door of the government building calling on the governor to come out. «Probably, for the first time ever, the front door of the government became a tribune for an opposition meeting,» Bloger51 reports. Police presence in the area was sparse and the protesters were left alone without detentions. After 20 minutes, the rally dissolved and the protesters went home. It all proceeded in a civilised way both from the side of the protesters and the police, the regional blogger says.